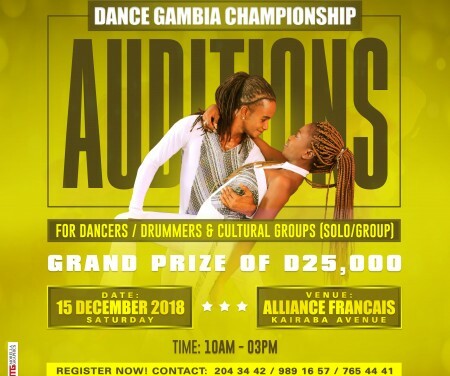 On 15 December, the project Dance Gambia Championship will kick start at Alliance Francais, Kairaba Avenue. Dancers, drummers and cultural groups can present their talent during closed door auditions from 10 am to 3 pm. The auditions will be streamed live on Facebook with Eye Africa online TV. After the auditions, successful participants will be challenged to learn new dance styles and present them during weekly live shows between 23 February and 30 March 2019. There will also be Performing Arts workshops and all participants will have mentors.The winner gets D 25,000 and a scholarship to study Performing Arts as a full time career. Register now by contacting 204 34 42 / 989 16 57 / 765 44 41.